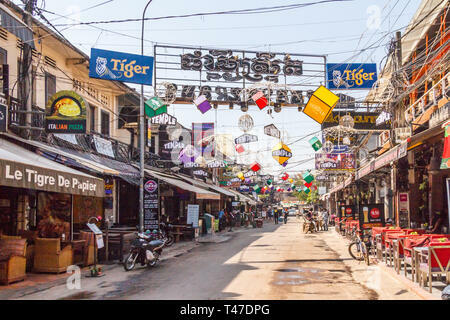 Siem Reap, Cambodia - 14th January 2018: Bars and restaurants on Pub Street. 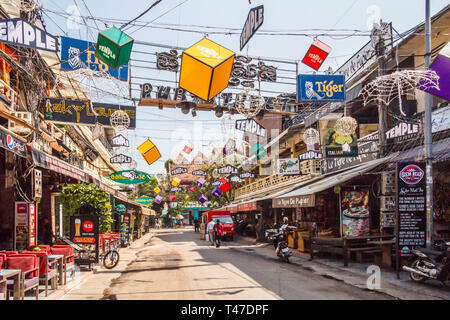 This is a popular street for tourists. 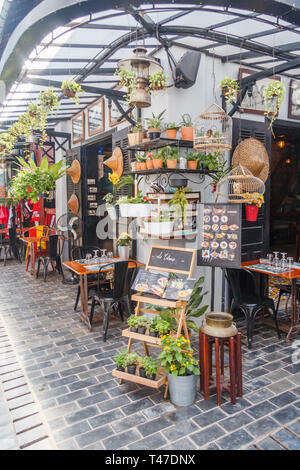 Siem Reap, Cambodia - 10th January 2018: Bar/restaurant in tourist street. 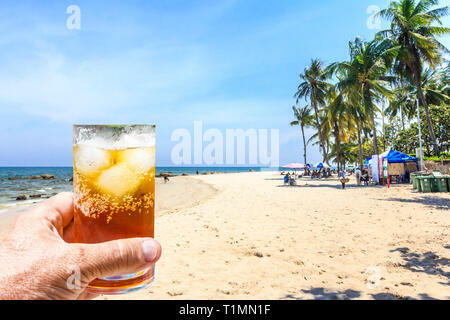 There are many tourists visiting the city. 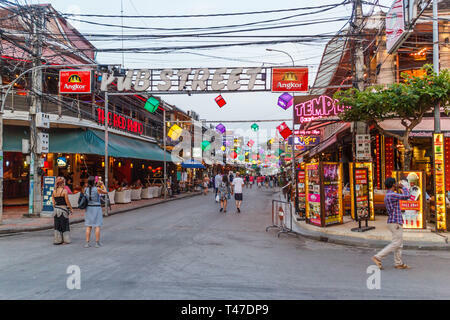 Siem Reap, Cambodia - 11th January 2018: Colouful neon lights of Pub Street. 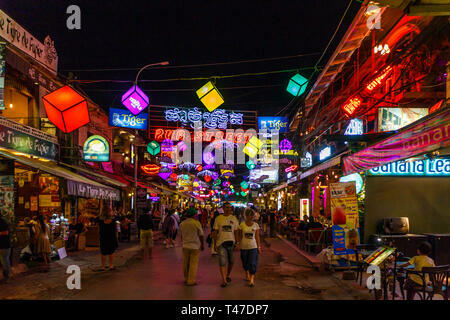 This is a popular night entertainment area for visiting tourists. 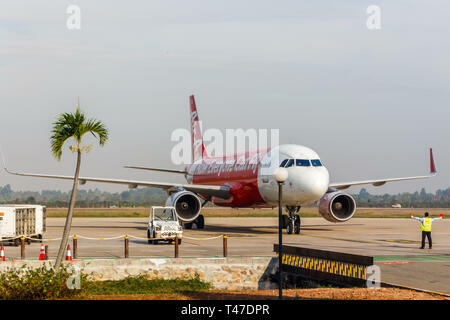 Siem Reap, Cambodia - 16th January 2018: Air Asia aeroplane arriving at Siem Reap airport. 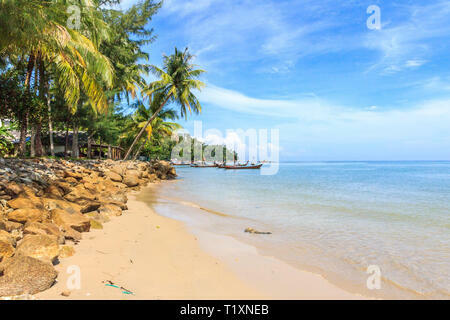 The airline operates flights to Thailand and Malaysia. 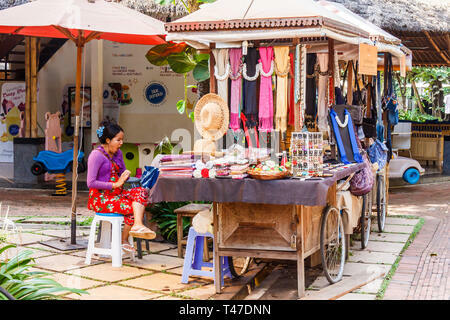 Siem Reap, Cambodia - 10th January 2018: Vendor selling souvenirs at the King Road craft market. 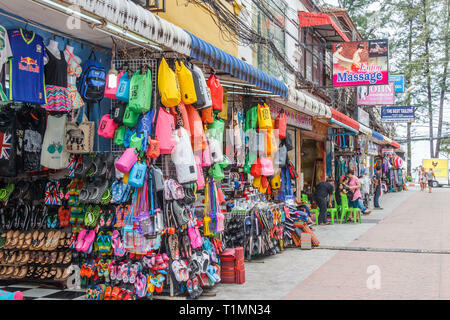 All sorts of handicrafts are sold. 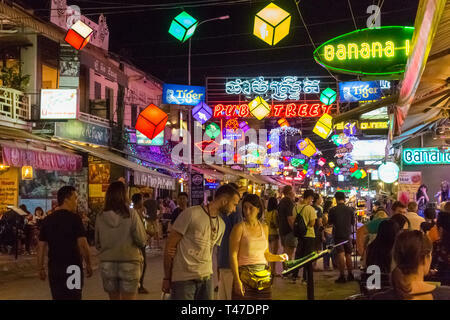 Siem Reap, Cambodia - 15th January 2018: Colourful bright lights, Pub Street. 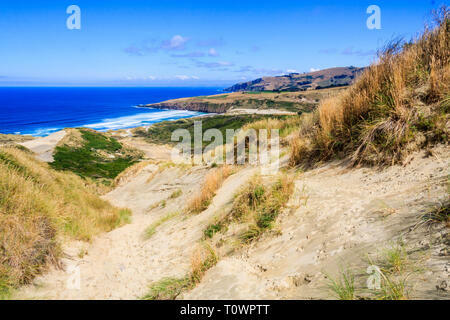 The area is popular with tourists. 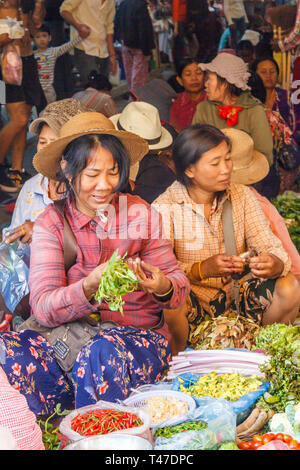 Siem Reap, Cambodia - 14th January 2018: Women selling vegetables in the Old Market. 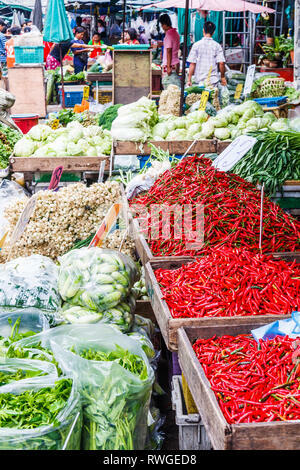 The market is open every day for local produce. 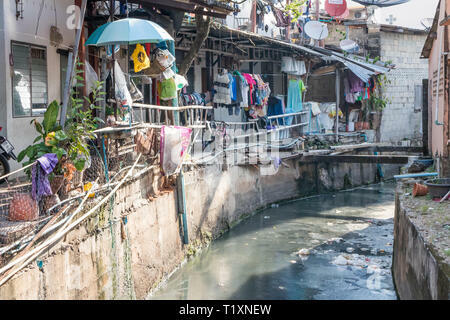 Phuket, Thailand 21st January 2019: Polluted canal by the side of dwellings in Phuket Town. 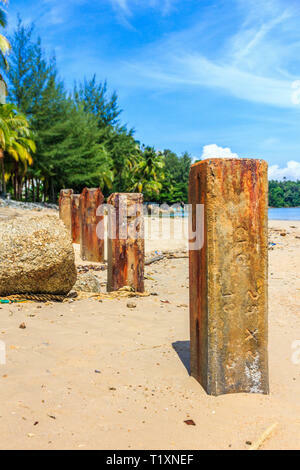 Pollution is a big problem throughout Asia. 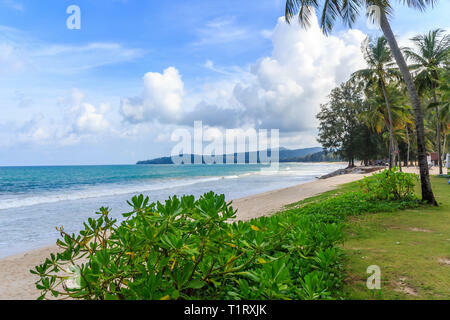 Phuket, Thailand 17th January 2019: The Royal Paradise Hotel, Patong beach. 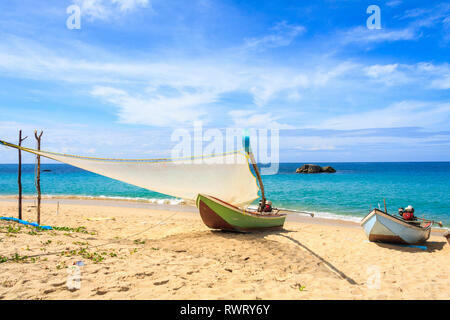 The resort town is renowned worldwide. 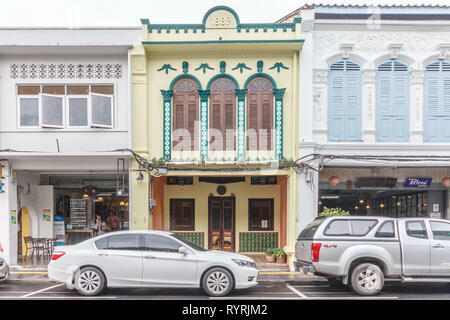 Phuket, Thailand 21st January 2019: Renovated Sino Portuguese mansion in Old Phuket Town, Many houses have been renovated. 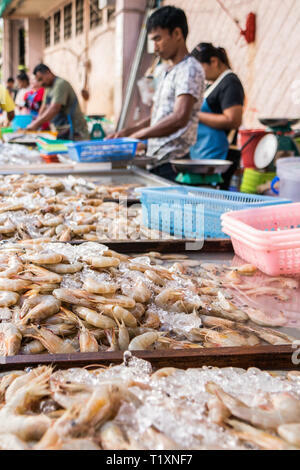 Phuket, Thailand 21st January 2019: Prawns for sale at the town market. 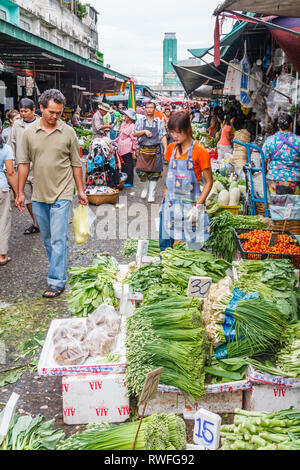 The market is open early morning every day. 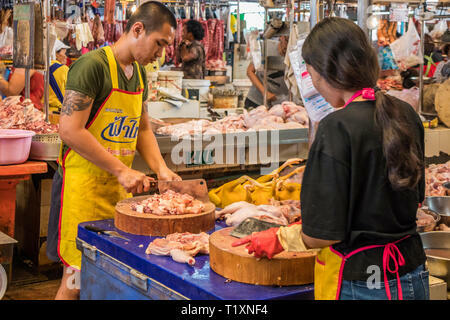 Phuket, Thailand 21st January 2019: Man chopping chicken in Phuket Town market. The market is open early morning. 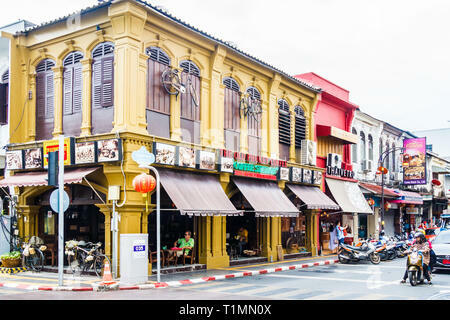 Phuket, Thailand 21st January 2019: The renovated Novotel in Phuket Town. 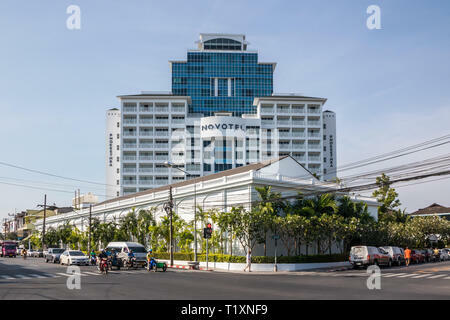 The hotel is part of a chain. 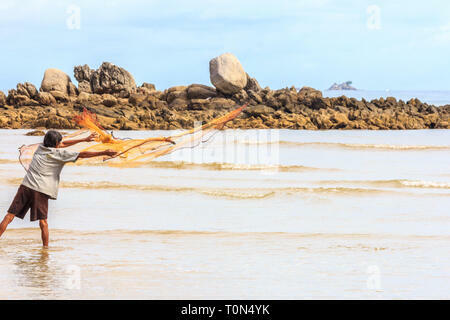 Phuket, Thailand 17th January 2019: Chinese tourists waiting to cross the road in Patong beach. 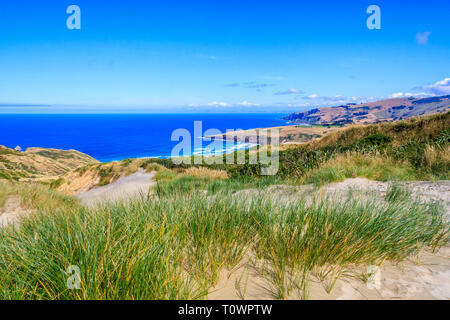 The resort town is renowned worldwide. 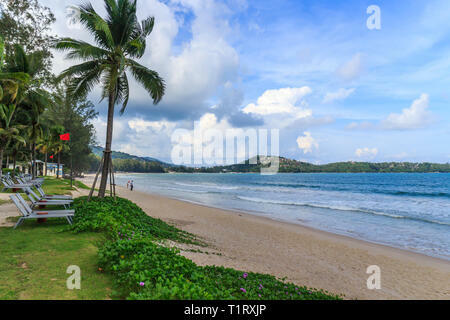 Phuket, Thailand 17th January 2019: Police checking tourists driving licenses in Patong Beach. 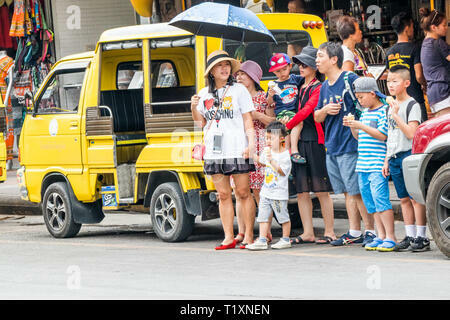 Police often fine tourists for traffic offences. 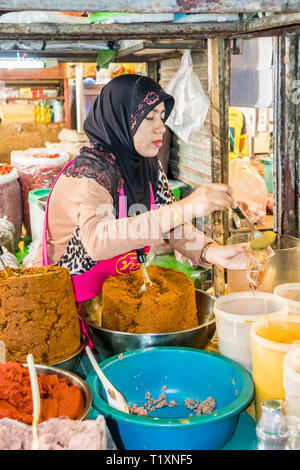 Phuket, Thailand 21st January 2019: Muslim woman serving spices at the town market. 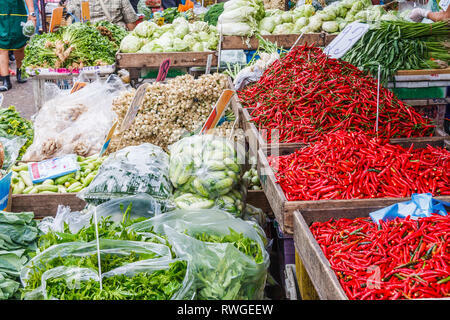 The markets is open early every day. 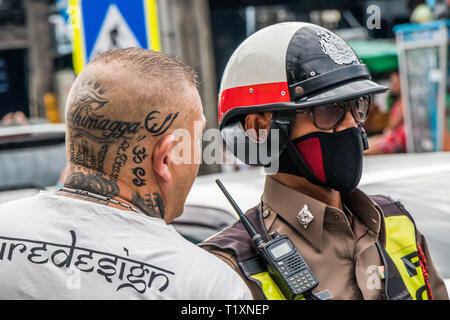 Phuket, Thailand 17th January 2019: Man with tattooed head talking with policeman in Patong Beach. 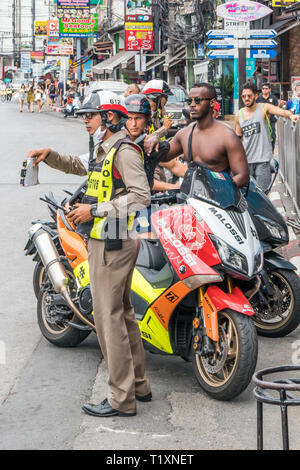 Police often fine tourists for traffic offences. 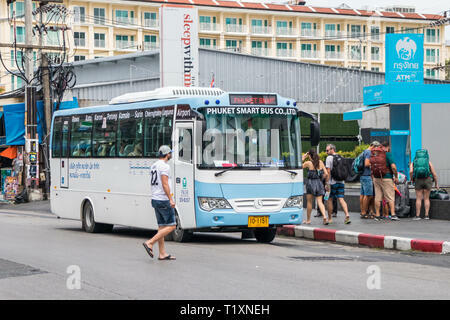 Phuket, Thailand 17th January 2019: Tourists boarding the Phuket Smart Bus. 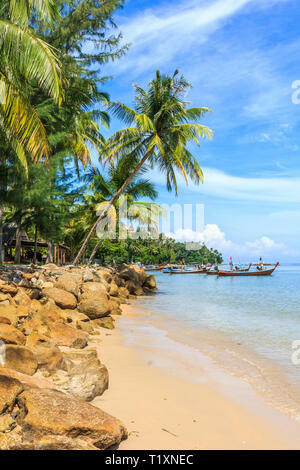 The regular service from the airport to Rawai was introduced in 2018. 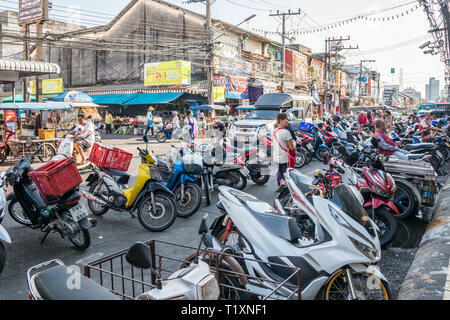 Phuket, Thailand 21st January 2019: Motorcycles parked outside the market in Phuket Town. 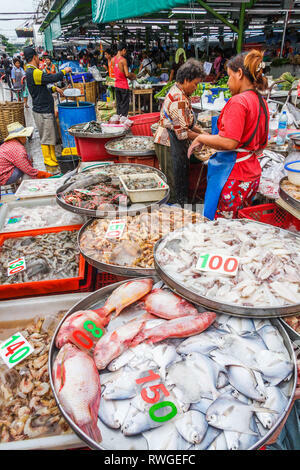 The daily market is busy in the mornings. 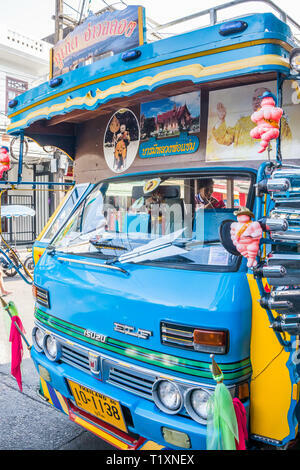 Phuket, Thailand 21st January 2019: Closeup of a traditional Phuket bus. 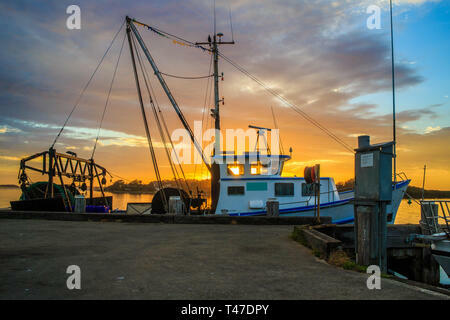 Services run to many parts of the island from the town. 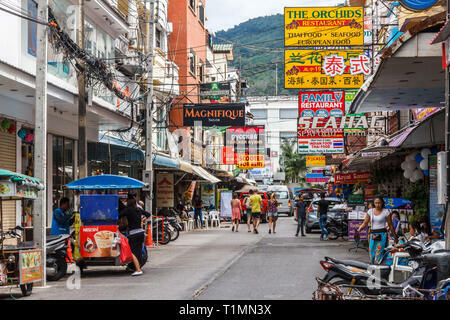 Phuket, Thailand 17th January 2019: Typical street scene in Patong. 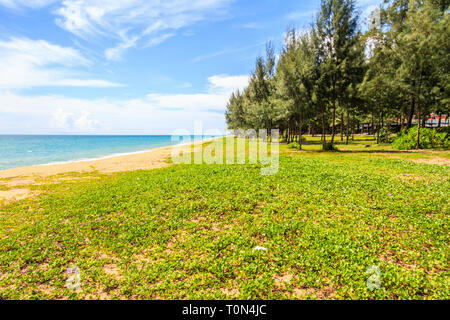 The resort is renowned worldwide. 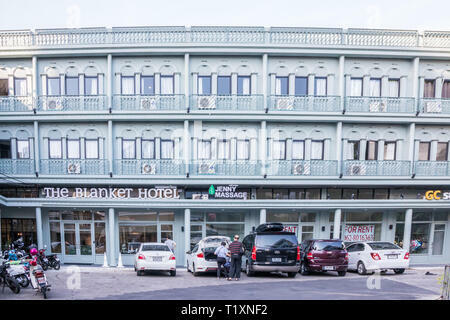 Phuket, Thailand 21st January 2019: The Blanket Hotel in Phuket Town. 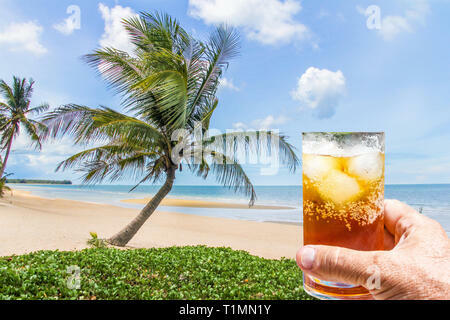 Many new hotels have opened to meet the demands from tourists. 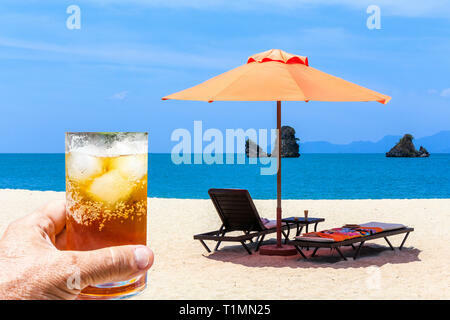 Phuket, Thailand - 26th April 2018: The Old Phuket Coffee shop. 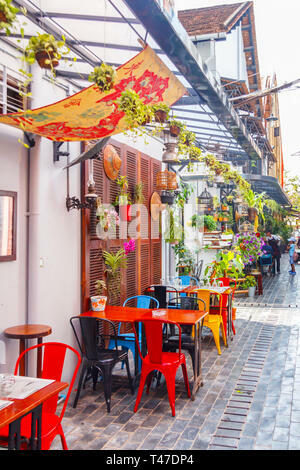 There are many cafes in the town catering to tourists. 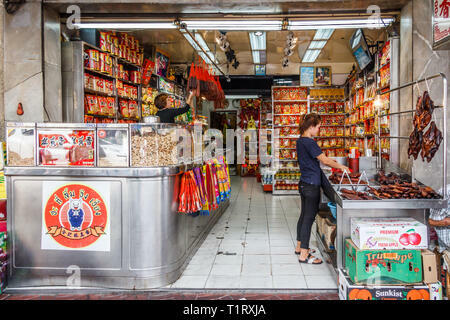 Bangkok, Thailand - 7th March 2017: A Chinese grocery store on Yaowarat Road. This is the main road through Chinatown. 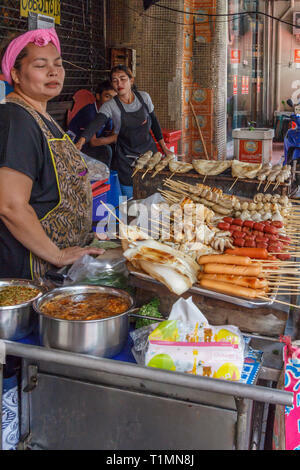 Bangkok, Thailand - 7th March 2017: Street food vendors selling barbecued sausages and squid in Chinatown, Most Thais eat street food. 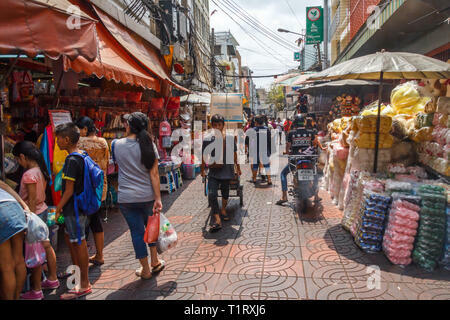 Bangkok, Thailand - 7th March 2017: Typical street scene in Chinatown. The area is bustling with shoppers. 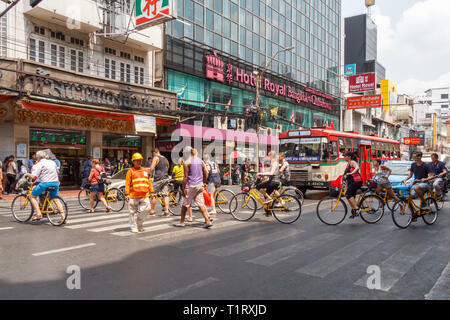 Bangkok, Thailand - 7th March 2017: Tourists on a bicycle tour crossing Yaowarat Road. 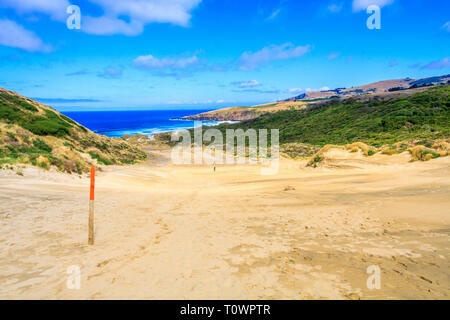 This is the main road through Chinatown. 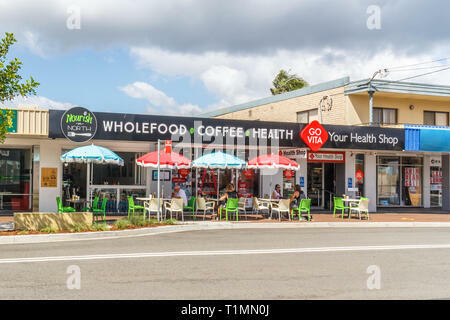 Batemans Bay, Australia - 12th February 2018: People drinking coffee in the sunshine. 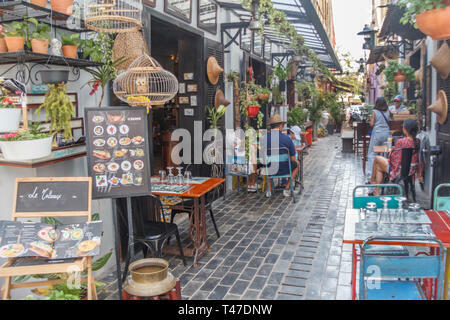 Cafe culture is popular in Australia. 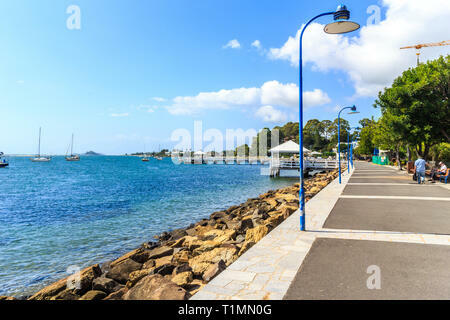 Batemans Bay, Australia - 12th February 2018: People walking along the promenade. 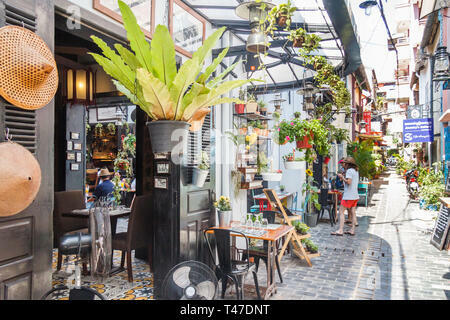 The promenade is a popular spot. 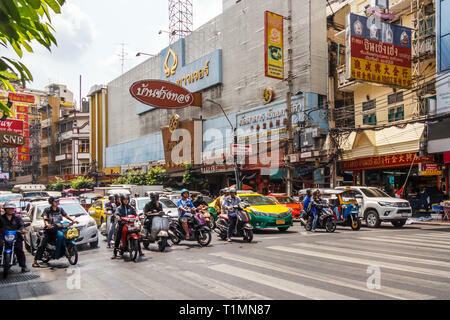 Bangkok, Thailand - 7th March 2017: Traffic waiting at traffic lights on Yaowarat Road in Chinatown. 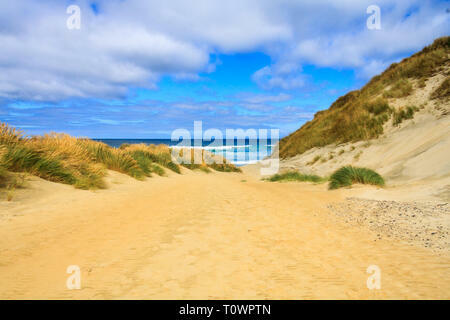 The roads are always very busy. 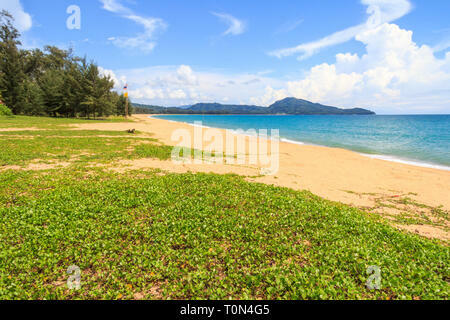 Patong Beach, Thailand - 6th January 2017: Souvenir shops and massage parlours. 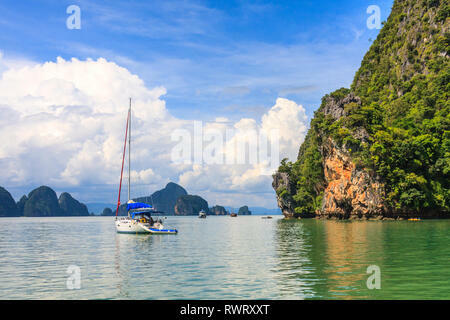 Phuket is a renowned holiday destination. 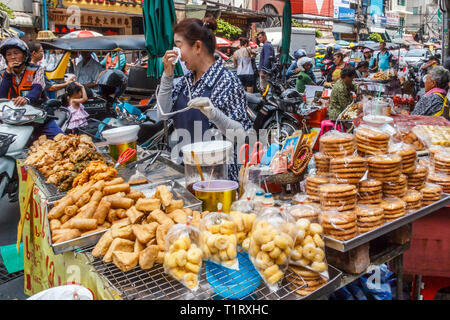 Bangkok, Thailand - 7th March 2017: Street vendor wiping her eyes on Yaowarat Road.. This is the main road through Chinatown. 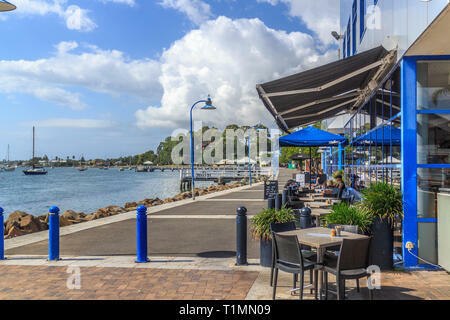 Batemans Bay, Australia - 12th February 2018: People drinking coffee in the sunshine. 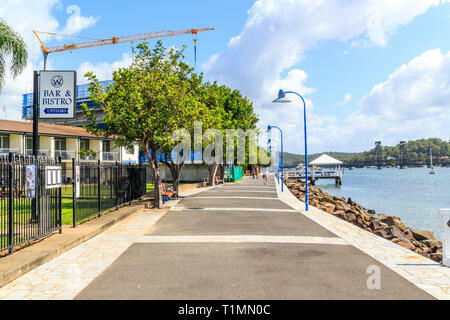 The promenade is a popular spot. 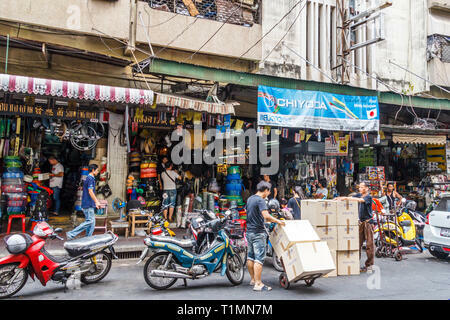 Bangkok, Thailand - 7th March 2017: Street of hardware stores in Chinatown. 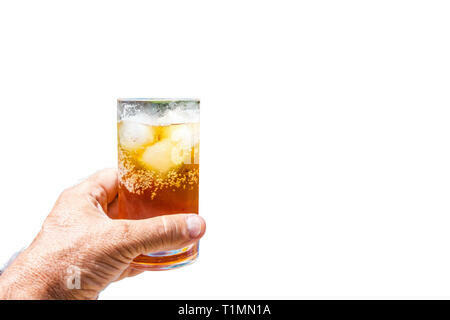 Many goods are imported from China. 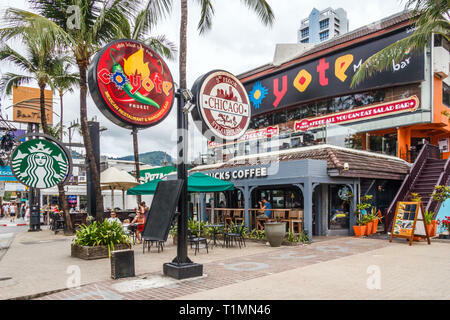 Patong Beach, Thailand - 6th January 2017: Cafes and restaurants on the main beach road. 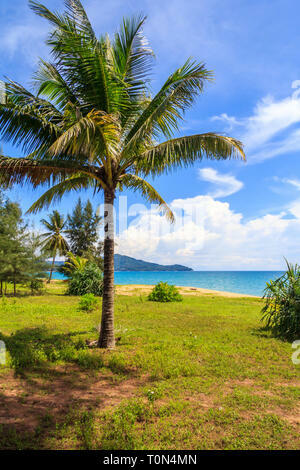 Phuket is a renowned holiday destination. 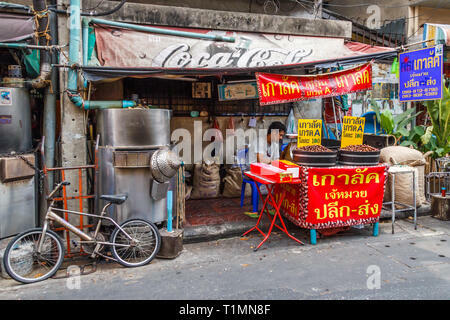 Bangkok, Thailand - 7th March 2017: Man selling roasted chestnuts in Chinatown, Chestnuts are a popular snack. 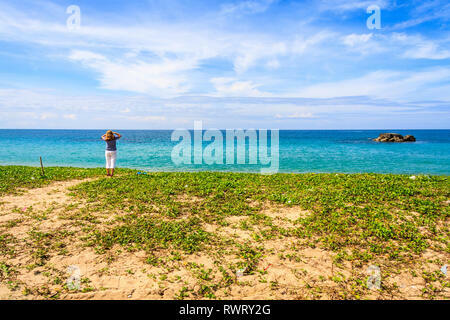 Arroyo de la Miel, Spain - 17th June 2018: Girl with fan wearing a fascinator at a local fiesta. 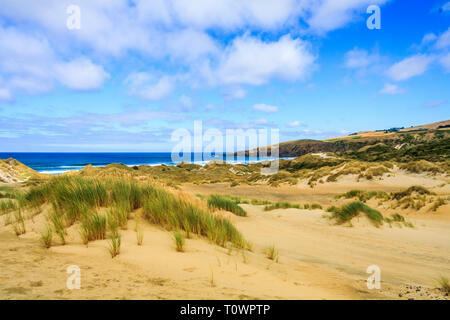 Spain is famous for its fiestas. 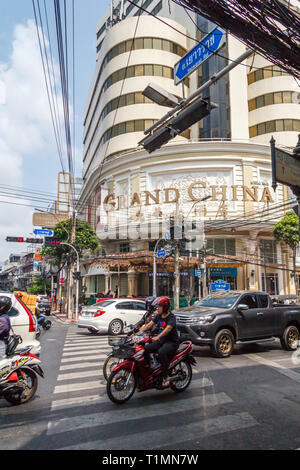 Bangkok, Thailand - 7th March 2017: Traffic passing the Grand China building in Chinatown. 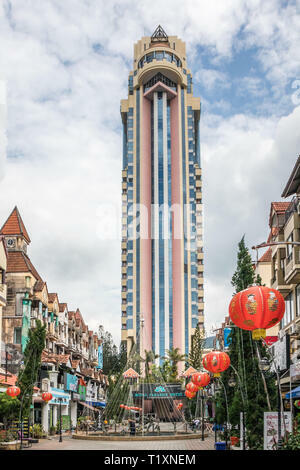 The building is both a hotel and a shopping mall. 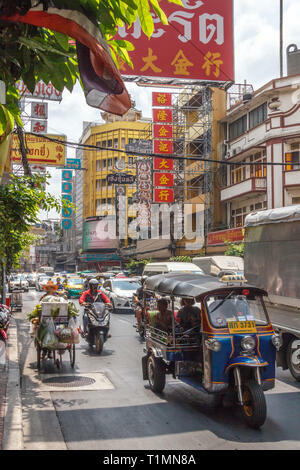 Bangkok, Thailand - 7th March 2017: Tuk tuk amongst heavy traffic on Yaowarat road. The road is the main artery through Chinatown. 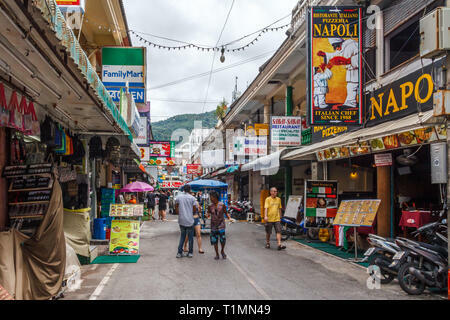 Patong Beach, Thailand - 6th January 2017: Shops and restaurants off the main beach road. 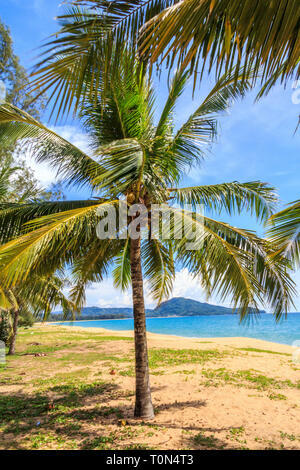 Phuket is a renowned holiday destination. 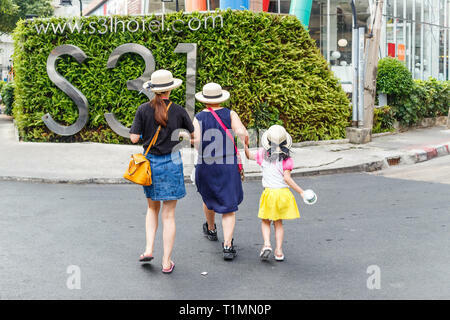 Bangkok, Thailand - 23rd March 2018: 3 generations crossing the road wearing hats. 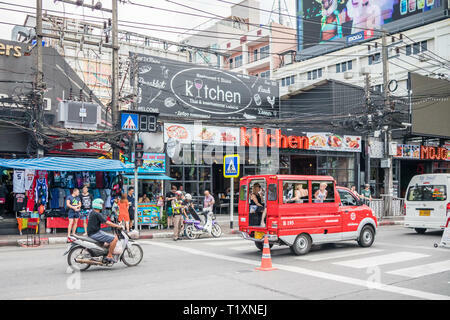 The city is very popular with tourists. 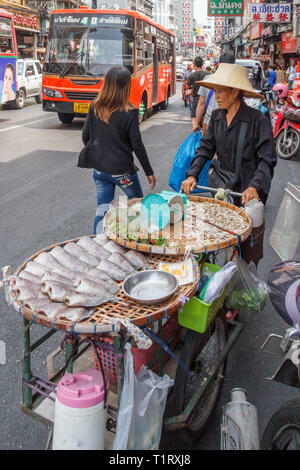 Bangkok, Thailand - 7th March 2017: Street food vendor pushing her cart down Yaowarat road. This is the main road through Chinatown. 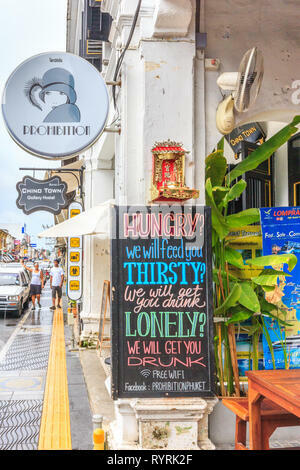 Phuket, Thailand - 11th April 2017: Sign outside a cafe bar on Yaowarat Road. 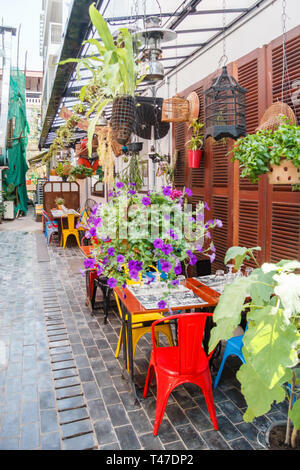 Many cafes have sprung up in the city. 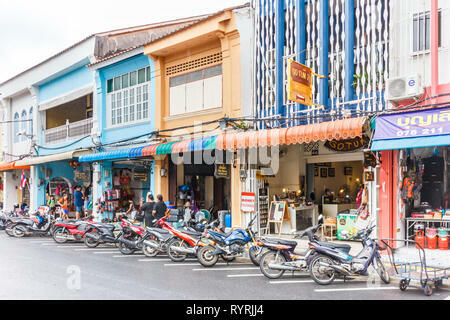 Phuket, Thailand - 11th April 2017: Motorcycles parked outside shops on Thalang Road. 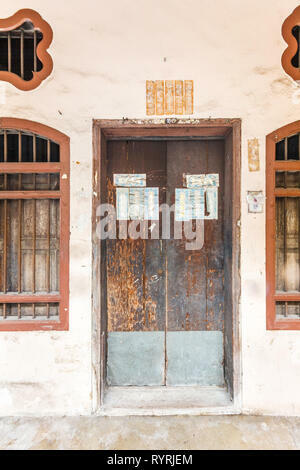 This is one of the main streets in the old town. 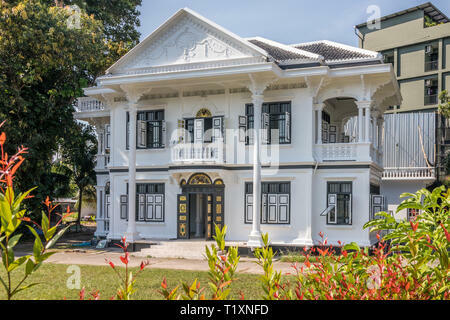 Phuket, Thailand - 11th April 2017: Unrestored Sino Portuguese architecture. Many buildings in the city have been restored. 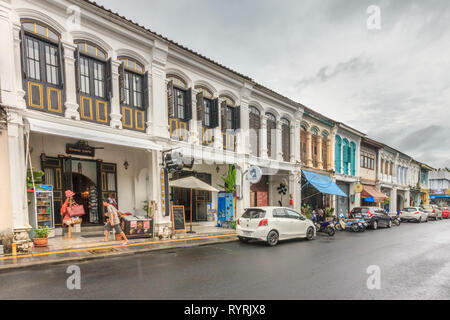 Phuket, Thailand - 11th April 2017: Sino Portuguese architecture on Thalang Road on a stormy day. 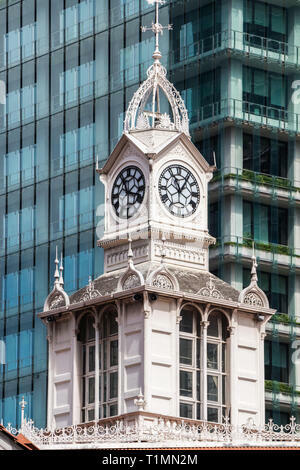 Many buildings have been restored. 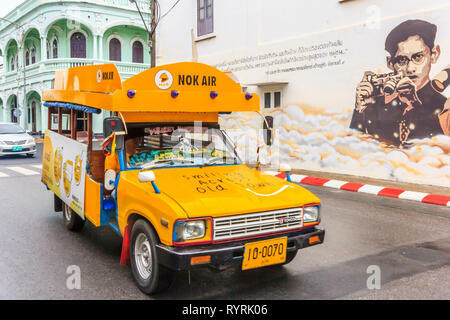 Phuket, Thailand - 11th April 2017: Yellow songthaew or taxi driving past mural of the late King. King Bhumibol was much revered. 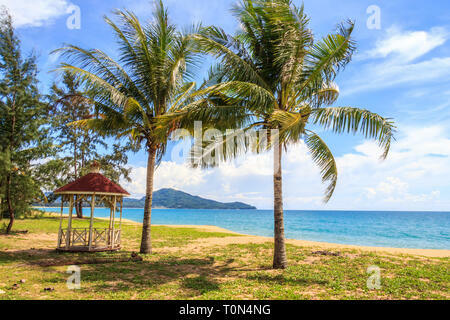 Phuket, Thailand - 11th April 2017: Young Asian tourists taking photos. 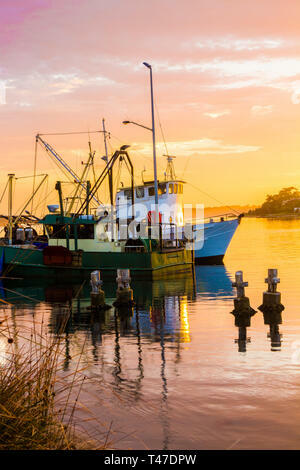 The old town is very photogenic. 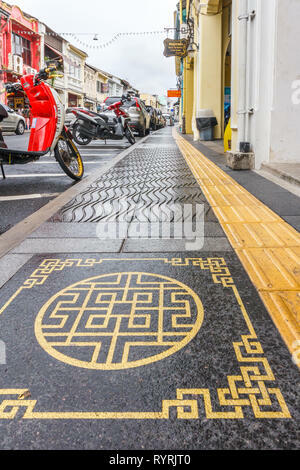 Phuket, Thailand - 11th April 2017: New pavements with ornate Chinese design. 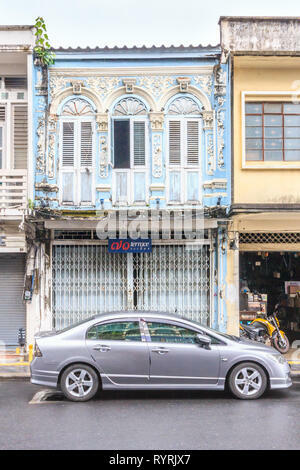 Many parts of the old town are being rejuvenated. 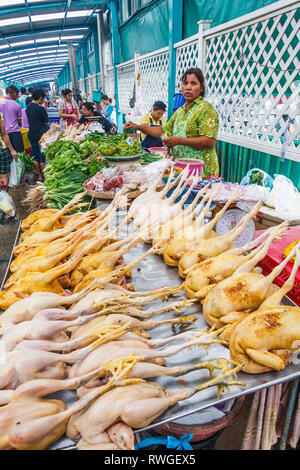 Bangkok, Thailand - 6th September 2009: Chicken vendor on Khlong Toei market. 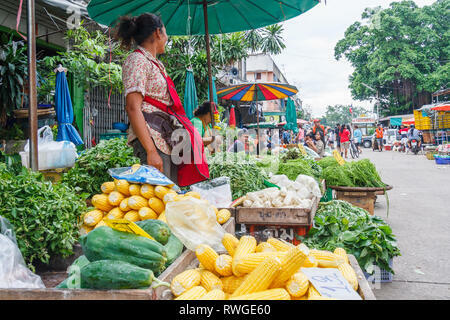 The market is the largest wet market in the city. 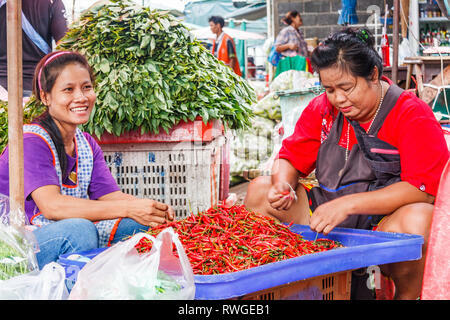 Bangkok, Thailand - 6th September 2009: Vendors sorting chillies on Khlong Toei market. 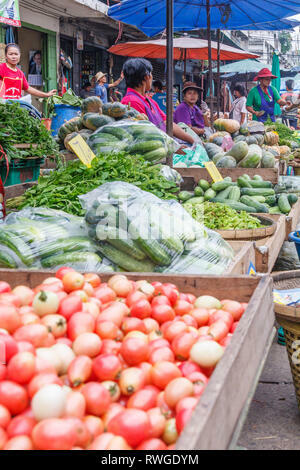 The market is the largest wet market in the city. 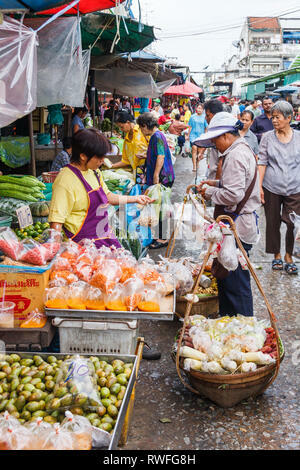 Bangkok, Thailand - 6th September 2009: Vendors on Khlong Toei market. 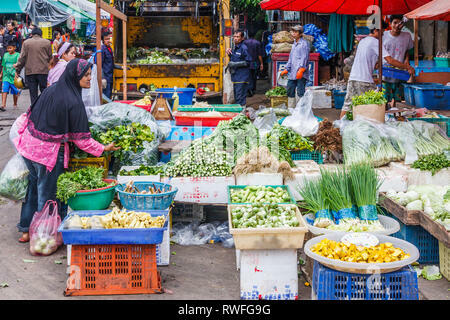 The market is the largest wet market in the city. 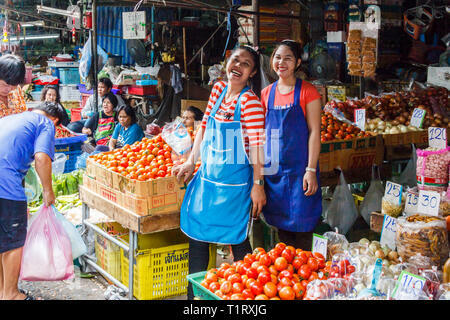 Bangkok, Thailand - 6th September 2009: Shoppers on Khlong Toei market. 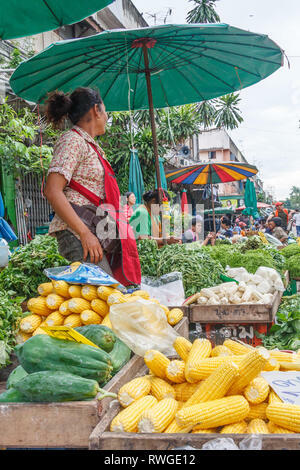 The market is the largest wet market in the city.